And maybe Mary was a lesbian, contends the work by a Christian student, whose performance of the poem is proving popular on YouTube. 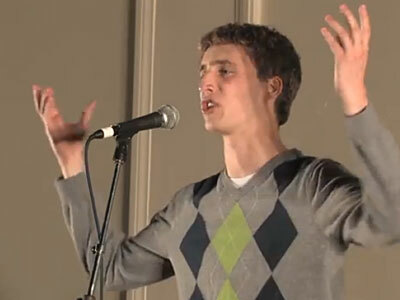 So begins the poem “God Is Gay,” by a straight, Christian college student whose slam performance of the work has become a hit on YouTube, with nearly 80,000 views so far. Elliot Darrow, a student at the University of North Carolina, performed the poem in the College Unions Poetry Slam Invitational in April, and video of his appearance was posted to YouTube in May, but it’s had a recent spike in viewings.